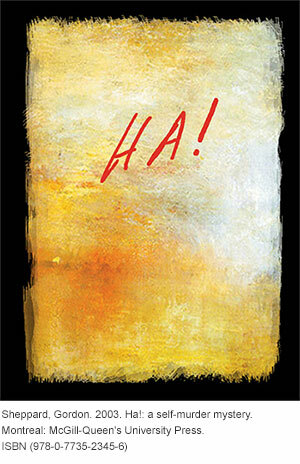 The year 2013 marks the 10th anniversary of a Canadian publishing phenomenon – the ushering into print of Gordon Sheppard’s experimental novel HA! : A Self-Murder Mystery on the life and death of the celebrated French-Canadian writer Hubert Aquin. HA! makes a dead man rise. In an article for the Literary Review of Canada, October 2003 under the heading of “Requiem for a Suicidal Genius (Gordon Sheppard & HA! )”– I believe the first full-length treatment of the book in Canada – I classified the book as an anatomy. The publisher, McGill-Queen’s University Press, quoted from my article in the paperback edition of the book: “Sheppard writes an anatomy of suicide in the twenty-first century as Robert Burton wrote an anatomy of melancholy in the seventeenth …a kind of Zen and the Art of Motorcycle Maintenance for suicide … the most thorough-going exhumation and interrogation of a dead body that I have come across in my reading.” Two other Hamiltonians – poet Marilyn Gear Pilling and columnist Jeff Mahoney – were also quoted inside the front cover. I met Gordon for coffee on Dundurn Street in Hamilton through my friendship with Marilyn Gear Pilling. Aesthetically, HA! is a beautiful and pleasing object. The Rothko-like cover, the photographs, the document-inserts, the newspaper excerpts, the bulk (almost 900 pages), the drawings, the interviews, the typographical fonts, the handwritten letters, make it an object with a large presence and an extensive wake. Artistically, HA! for all its thoroughness in investigating the nature, the literary history and motive of suicide, is a work of profound mystery. It conceals as much as it reveals; it performs, plays, probes; it conducts an autopsy while leaving the body unmolested. Novel, film script, play, musical score, documentary: HA! entrances by its strangeness, charms by its details and evades critical capture by moving within the paradox that to know almost everything about one human person is still not to know the inner self.